Ludovic Nicolaidis, also known as LethalFX, makes his living as a beatboxer. 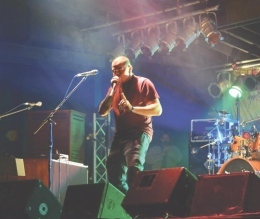 He said he hopes to bring more attention to beatboxing as an art form through planning the first Midwest Beatbox Battle, which will be held at the Lemon Grove on Friday. Photo courtesy of Ludovic Nicolaidis. Ludovic Nicolaidis, a Youngstown native, is gathering kindred spirits for the first Midwest Beatbox Battle on Friday at the Lemon Grove. Beatboxing is a vocal art form that started by mimicking drumbeats. As it has evolved, electronic elements and live looping have been incorporated. Nicolaidis has been beatboxing for eight years. He derived his stage name, LethalFX, from his Xbox Live screen name. He said the competition is a way for beatboxers to come together. “It’s going to be like a family reunion,” he said. Nicolaidis said beatboxing is important to him because it’s his creative outlet and the way he makes his living. He said he hopes people can look beyond any misconceptions to see the art in his passion. On Thursday, the day before the battle, the Lemon Grove will feature performances from both local beatboxers and those from Chicago, Texas, Pennsylvania and other areas. Youngstown State University student Justin Mullane is performing and competing in the battle as well. Mullane performs under the stage name Prometheus or Pro. He said he got the idea from a character in Greek mythology who brought fire to humankind. Nicolaidis and Mullane met through mutual friends, and they’ve performed together before. “I went to him for pointers,” Mullane said. When the two beatbox together, they have individual strategies. Nicolaidis stretches his mouth and then mocks a guitar being strummed through an amplifier, while Mullane deepens his voice and mocks a bass guitar. Nicolaidis got the idea for a Midwest Beatbox Battle when he attended the American Beatbox Championships in New York. He would like to have the Midwest battle become an annual event. Terry Lewis, one of the judges who goes by the name Kid Lucky, is another Youngstown native. Other judges are Yuri Lane and JFlo. Lewis said he is excited to return to Youngstown for the battle. He said the beatboxing scene in New York, where he lives now, is different than the scene in Youngstown. “We have a whole lot of beatboxing in theater and performing arts,” he said. They will judge the battlers based on originality, stage presence, crowd reaction and flow. “The battling is for fun, but the event is to unify everyone’s beats,” Nicolaidis said. Mullane said he enjoys incorporating looping synthesizers and other electronic effects into his stage show. “A lot of people ask me if I’m a robot and I of course tell them, ‘Yes,’” Mullane said. He said he’s not sure that beatboxing alone will pay the bills in the future, but he said he hopes music will. Mullane said he likes to incorporate the different effects because he has a diverse taste in music. He is also in a reggae band. Nicolaidis, though, beatboxes for a living and performs at least four times a month. “I don’t know that beatboxing can ever go mainstream, but if I can live comfortably with it, I’m OK with that,” Nicolaidis said. Mullane agrees that beatboxing is more for fun, but encourages others to give it a chance. Nicolaidis said originality is key in beatboxing. “When people find what makes them original, then they’ll be able to keep someone’s attention,” Nicolaidis said. They both said they hope the word about beatboxing gets out to the public to the point that people ask them to drop a beat.